There is growing international controversy over the US' Israel Anti-Boycott Act, legislation which would expand a 1970s-era export law and expose individuals engaging in a range of activities to sweeping penalties, including criminal prosecution and hefty fines. Critics say it is a clear breach of the US Constitution's free speech protections. The Act would amend and expand the Export Administration Act of 1979, which prohibits US citizens and companies from complying with or supporting boycotts imposed by a foreign country on a US ally. It was passed in response to the Arab League's boycott of Israel, which obliged US firms to boycott Israel and Israeli companies as a condition of doing business. 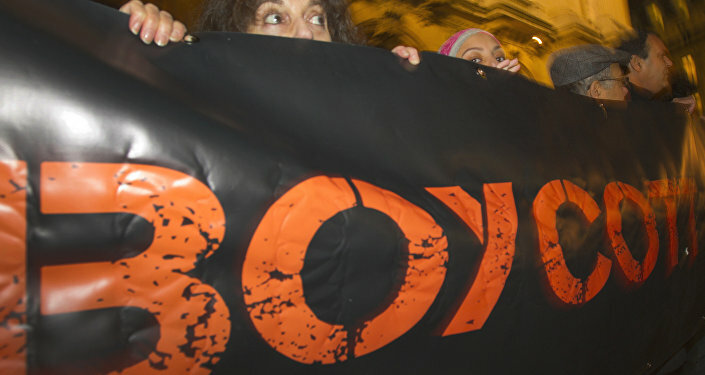 The new Act expands the law by prohibiting all US citizens and businesses from boycotting Israel and Israeli businesses (including businesses operating in the occupied Palestinian territories) in adherence with any boycott administrated by international governmental organizations, such as the United Nations and the European Union. Even unintentional violators could be fined up to $250,000, and wilful violations are subject to criminal prosecution, carrying a maximum sentence of up to US$1 million and 20 years in prison. ​While a seemingly meager change, the original law could at least be said to have protected US companies from foreign government coercion — the proposed new amendments prohibits individuals from participating in certain boycotts outright, a right protected under the US Constitution's First Amendment. While the Act's supporters have been quick to point out no international governmental organization is currently engaged in a boycott against Israel, its statement of policy expressly opposes the United Nations Human Rights Council's March 2016 resolution calling for a database of companies operating in the occupied Palestinian territories, and declares Congress views the policy as a move to "boycott, divest from, or sanction Israel" — in other words, the Act's authors evidently take the UNHRC's proposals as tantamount to a boycott. As a result, any individual or business that refuses to purchase goods made in Israel or the occupied Palestinian territories by even one company would be violating the law. Given the severe penalties for falling foul of the Act's provisions, it's presumable at least some citizens and businesses would refrain from boycotting Israel at all out of fear of reprisal. Moreover, aside from limiting the right to not purchase goods for political reasons, the Act prohibits individuals from even requesting information about whether a person is doing business in Israel, regardless of whether the requester is actually engaged in a boycott. While the Boycott, Divestment, Sanctions (BDS) movement — a renowned global campaign seeking to apply economic and political pressure to Israel in order to compel the country to comply with international law — is theoretically not covered by the law, as BDS members and supporters often refer to international governmental organizations' boycott requests or policies to support their own advocacy, the Act threatens to sanction BDS-supporting individuals and/or companies too. The bill also could sanction BDS supporters who identify companies dealing with businesses listed in the UNHRC database. The Act's lead author, Democratic Senator Ben Cardin of Maryland, has claimed individual American citizens who back boycotts Israel would face no legal consequences as a result of the bill — but the Office of Antiboycott Compliance's own website clearly defines a "US person" as all individuals, corporations and unincorporated associations resident in the United States, including the permanent domestic affiliates of foreign concerns, including US citizens abroad (except when they are employed by non-US businesses). Furthermore, even if the Act's authors promise not to prosecute individual consumers under the bill, subsequent governments may have different ideas and interpretations, meaning private citizens have every reason to be concerned about its passing. Luckily for critics, co-sponsors of the bill have faced immense pressure over their support, and several, including Republican Joe Kennedy III of Massachussets, and Democrats Kirsten Gillibrand of New York, Maria Cantwell of Washington, Ron Wyden of Oregon, Claire McCaskill of Missouri, and Richard Blumenthal of Connecticut. At a July 22 town hall meeting in New York, Gillibrand was questioned on her co-sponsorship by representatives of campaign group Jewish Voices for Peace. In response, she said she was reviewing the Act, and criticized Israeli Prime Minister Benjamin Netanyahu, whom she said had no vision for peace in the region.